How is SocialBee different from Buffer? SocialBee provides you with tools that are perfect for scheduling content that you can use again and again. This way we can save you a few hours each week to let you focus on your business. Plus, we have the GROW and ENGAGE features, that Buffer is missing altogether. With Buffer, you can schedule each post only once. If you want to repost something, at the end of your queue, you’ll have to go through a series of steps to reschedule that particular post. You’ll have different needs for different types of content. With Buffer, you cannot categorize your content according to your needs. Ah, but you can do so with SocialBee. Using our category system, you’ll be able to choose which posts you only share once and which ones you want to share over and over again (hint, it’s the good ones, you’ll have to share more). 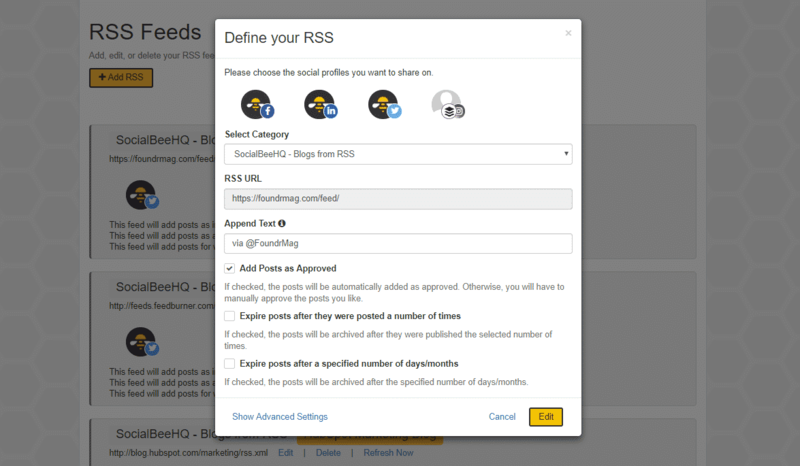 Both Buffer and SocialBee allow you to import RSS feeds, add a Pocket feed or CSV Files to fill up your queue faster. However, with Buffer Feedly requires you to have a pro account to upload RSS Feeds. With SocialBee you can add RSS feeds directly into your categories, Import links or CSV files, use your Pocket account to share different tags to multiple content categories. Extra – did I tell you about our very own Social Media Team? Beside our powerful Social Media Management Platform, we have a Team of Social Media Specialists – or Social Media Bees, as we like to call them – that provide a suite of Concierge Services which will help you with Social Media Posting, Growth, and Engagement. Find out more about our Concierge Services here. So Should I use Buffer or SocialBee? You only want to use it for scheduling your content.